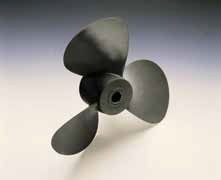 Short hub propellers can be identified by looking at the length of the hub splines. Short hub splines extend to the full length of the nut end of the spindle. Prop shaft length from gear housing to end of shaft 4-11/16"